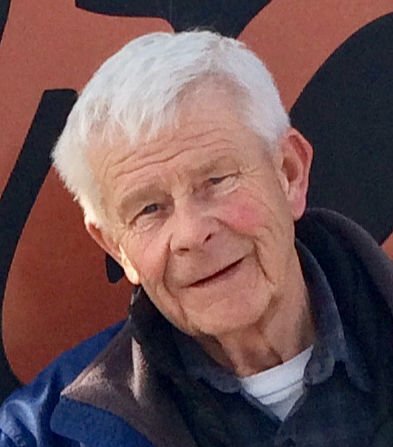 Aaron G. Peterson, 79 of Great Falls and Seeley Lake died on Thursday, April 4, 2019. Aaron was born on February 17, 1940, in Eau Claire Wisconsin to Ephraim L. Peterson and Madge Wallace Peterson. When Aaron was four-years old, his father took a job as night editor with the Great Falls Tribune and moved the family to Great Falls. Aaron graduated from Great Falls High School with the class of 1958. While in high school, he met his lifelong sweetheart, Jeanne Noble at the Great Falls Public Library; both out with friends and neither were there to study. They chose different colleges but stayed together and married in 1961. Aaron graduated from the School of Business at The University of Montana. He worked thirty years professionally in banking and finance including ten years as the executive vice president and manager of the Dutton State Bank. He served in the Montana Air National Guard, and was a contributing member of JayCees and Lions Club service organizations. He continued to support the university cheering on the Griz from his seat in the north end zone. While they consider Great Falls their home, Aaron and Jeanne lived and worked much of their lives in small towns across Montana; Hamilton, East Helena, Dillon, Big Sandy, Conrad, Dutton, Monarch, and Seeley Lake. Aaron especially enjoyed the honest way of life and the fellowship in each of the communities they lived. He valued the friendships he made along the way and there was rarely a place he travelled in Montana where he didn’t run into someone he knew. Aaron was a prankster and a storyteller and he never passed up an opportunity to crack a joke because he loved to make people laugh. We will miss his playfulness and his quick wit. Throughout his life he held an appreciation for cars, old, new and the good deals! His idea of a good time was working at his mountain cabins, first at Monarch and then at Seeley Lake. He did find time to downhill ski or play a round of golf when the work was done. He felt especially happy sharing the cabins with his children and grandchildren at Christmas and in the summer playing in the water by day and sitting around the campfire at night. Thanks, Dad, for giving us a place to be together as a family. Aaron is survived by his wife of 58 years, Jeanne Peterson of Great Falls; daughter, Julie (Steven); and grandchildren, Zachary and Haley Burckhard of Missoula; son Eric Peterson of Wichita, Kansas; sisters Sheila (Harvey) Bjornlie of Pacific Palisades, California, and Penelope Barnes of Salt Lake City, Utah; his extended family of brothers and sisters in-law, and many nieces and nephews, and his faithful companion Rocky. Aaron is preceded in death by his father, mother, and brother Walker Norell Peterson. Special thanks to Dr. Engbrecht, Dr. Luoma, and the nurses and staff on the fifth floor of Benefis Hospital who were professional and compassionate with dad as he and mom navigated the difficult, but blessedly quick progression of his dementia. In lieu of flowers, please consider a donation to either the Seeley Lake Senior Center or the Maclean-Cameron Animal Adoption Center in Great Falls. Services are to be held at Croxford Funeral Home & Crematory on Friday, April 12 at 11:00 a.m. Please celebrate with us at a reception immediately following at the Elks Lodge located at 500 1st Ave. South.